Saridey Varalakshmi, popularly known as Telugu: ఎస్. వర లక్ష్మి. Varalakshmi (13 August 1925 - 22 September 2009) was a veteran Telugu and Tamil actress and singer. 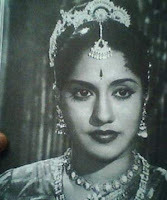 She was popular for her roles and songs in Telugu movies like Mahamantri Timmarasu and Sri Venkateswara Mahatyam and Tamil movies like Veerapandiya Kattabomman and Savale Samali. Born :13 August 1925,Jaggampeta, Andhra Pradesh . Varalakshmi was born in Jaggampeta, Andhra Pradesh, India. She started her career as child artist in saint role in Balayogini (1937), when she was nine years old. Gudavalli Ramabramham was engaged by the pioneer filmmaker K. Subrahmanyam to direct the Telugu version of this movie. He spotted young Varalakshmi in Kurnool. Subramanyam later cast her in his classic Seva Sadanam (1938) with M. S. Subbulakshmi. She played a young friend of the heroine (M.S. ), and they became close friends. She played a young girl’s role in Parasuraman (Tamil, 1940) along with T. R. Mahalingam. T. R. Sundaram, cast her in a major role in his box office hit ‘Aayiram Thalai Vaangi Apoorva Chinthamani’ (1947). The title role was played by V. N. Janaki. The film was a major success and Govindan and Varalakshmi made an attractive pair. T. R. Sundaram cast her again in the lead role in ‘Bhojan’ (1948). Her first successful movie was Balaraju in 1948 produced and directed by Ghantasala Balaramaiah. She later acted with all top heroes in Telugu and Tamil industries including Sivaji Ganesan (Veerapandiya Kattabbomman), M. G. Ramachandran (Chakravarthi Thirumagal, Maattukara Velan, Needhikku Thalaivanangu), Gemini Ganesan (Poova Thalaiya), N. T. Rama Rao, ANR (Balaraju), Chittor V. Nagaiah (Naga Panchami), Ranjan (En Magan) and R. S. Manohar (Maamiyaar). She was also famous for her voice, and sung her songs in all movies she acted. Her roles as Sivaji's wife in Veerapandiya Kattabomman, and important roles in Poova Thalaiyaa, Savale Samali, Maattukkara Velan, Raja Raja Chozhan and Neethikku thalaivanangu won her critical acclaim as a talented singer and actress in Tamil movies. In her later career, she acted in mother and aunt roles. She married film producer A. L. Srinivasan and has two children. She continued to act after marriage in senior roles in Telugu and Tamil cinema. Varalakshmi was bedridden during the last 6 months of her life after she fell and injured her back. She died on 22 September 2009. Singer Year Film Language Songs Music Co-Singer!